Why is it every time I go to a race a fight breaks out. Pft, he just flat out tells them they need a new strategy to beat him. Hey, at least it's better than outright telling his opponent how to beat him like he did in SM64DS. The hubris of all super villains: the monologue! Well, it's half past Word O'clock and I have a minimum safe distance to run to. Bye! Shrapnel seems to enjoy the Boss Banter. I think Go and Palma's best bet is to go for the legs; those pants look to be hiding something! Seems like Shrapnel is channeling Thrive with his monologues and interest in Palma. Or maybe the supervillain types just love to hear themselves talk. They should break off his shrapnel crown making his shrapnel kingly might to become just a pile of shrapnel. The last thing I want to see is Shrapnel in hot pants. Yeah... that WOULD be pretty awful. If he ever had to show up, I'd hope it'd be as part of a battle that was more of a background fight with Luigi or Mario... one where neither combatant had paid any attention to the Chainless at all; Martello and the crew would just be unlucky. Naturally, whatever hijinks the crew are getting up to would have to stop abruptly as they got out of Dodge. Check out what I found! This is why I love Google. Hardyhar-har. I just looked up Mario vs. Wario, and it was on the top of the list. The old "I'm not the bad guy, I'm on your side!" Trick? I'm guessing he's the distraction, not the main event this time though. Also, Palma Badassery! Doesn't seem to be achieving much at the moment, but we shall see about that! There was a Taco Bell commercial a while back, where they were in a court room. The lawyer said "Great taste and fullness from a value menu. I do beleive I rest my case!" Any time the King Bo-Bomb speaks, I sorta imagine him having that lawyer's voice. He's supposed to be more along the lines of a Southern gentleman. I'm waiting for him to start adding like to the end of adjectives, so he'd sound a bit more properlike. Also, he needs to start opening sentences with "I do declare"
I do declare that would be coollike. Dang, forgot to log in before posting. Got bored, and started looking at random pages. Found this Morg's "Author's Comments" from page 72, near the end of chapter 2, right before Boss Birdo is finished off. "Major payoff is on the way, though, and the end of this chapter is going to be the start of something much, much bigger." Anyone else think we're not even close to as big as it's going to get? Been reading off and on, but Shrapnel doesn't seem too bad a guy. And everything he did in the past was when he had been working for the army. Now that he's been broken down and rebuilt, is Shrapnel going to join the Chainless? Haha. Perhaps it would have been better to say: Would he be able to be convinced to join the Chainless? I have a feeling Martello'd be just a little be reticent about allowing a giant, explosive former opponent on as part of her crew. But it would be so cool! 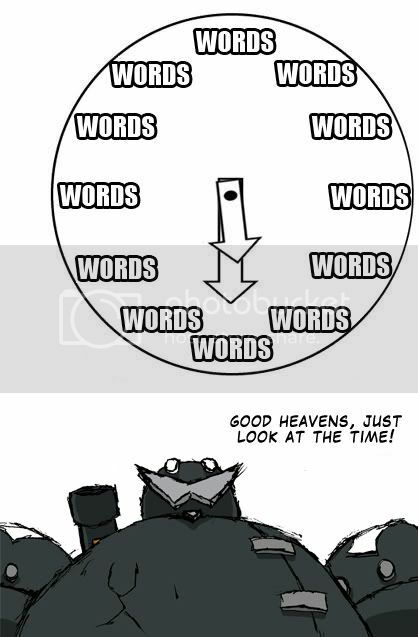 My clock's running a bit slow, I'm only words past words o'clock over here. And what does he mean "cheap tricks"? Their previous tricks were rather pricey. I find it creepy that Shrapnel is being so civil to the very lady he piledived not too long ago. OH GOD CHANGE! New layout! WHAT HAPPENED HERE WHILE I WAS GONE!? Morg made us all waffles! I tried to destroy the planet, but was taught the true meaning of your human friendship instead. Also yes, the waffles were pretty good. Yeah, never would have thought of using snozzberries! Lessee, i died like 20 times. I LOVE this villian! He is polite, well spoken, hits like a run-a-way freight train, pretty smart, AND he can hand out beatings WHILE MONOLOGING! Even Doc Doom has to pause the fight while doing his monolog but this guy? Notta Chance. You know, this is the only webcomic that I have dreams about.